How will Michael Cheika solve the talent versus toughness equation? Those were the words of Earvin ‘Magic’ Johnson back in 1984, at the start of one of the most epic finals series in NBA history. It was the Lakers against the Celtics, showtime LA against blue-collar Boston, Magic Johnson versus Larry Bird. Magic’s first encounter at Boston’s Logan Airport was typical of the town’s reaction to the Los Angeles Lakers as a whole. There were the disruptive phone calls to the Lakers’ hotel at three in the morning, gates to the schools where they arranged to practice mysteriously locked upon arrival, and even the coach driver of the team bus wore bright green with a grin. Boston was a tough town which neither expected nor gave any quarter, and its basketball team was modelled after its own dark heart. LA was the opposite, with its dancing Laker girls, Hollywood A-listers like Jack Nicholson and an exciting fast-break style of play. The critical moment of the 1984 series arrived in Game 4, with the Lakers holding a two-to-one lead. They had routed their rivals 137-104 in Game 3, and it looked very much like the sheer talent of Hall of Fame greats like Kareem Abdul-Jabbar, James Worthy and Magic was going to overwhelm the Celtics. Bird called out his teammates after that one, saying that “we played like a bunch of sissies”. He demanded Boston give up no more dunks, no more lay-ups and no more easy scores. It was time to draw LA into a physical, trash-talking war. That foul, and the bench-clearing melee which followed it, changed the entire tenor of the series. The Lakers lost their composure and their six-point lead, and Magic missed on a couple of free throws with only 30 seconds remaining. “Before McHale hit Rambis, the Lakers were just running across the street whenever they wanted. Now they stopped at the corner, pushed the button, waited for the light and looked both ways. Maxwell coined the term Tragic Johnson, and the Lakers suddenly became the Fakers. It was Maxwell who had the final word in Game 7, notching 24 points and eight assists and knocking the ball away from Magic as the Lakers tried one last rally. The Lakers would return to beat their great rivals in the 1985 finals, but it was on the back of a lesson they had learnt the hard way. The 1984 NBA finals were an object lesson in the relationship between natural talent and mental toughness. 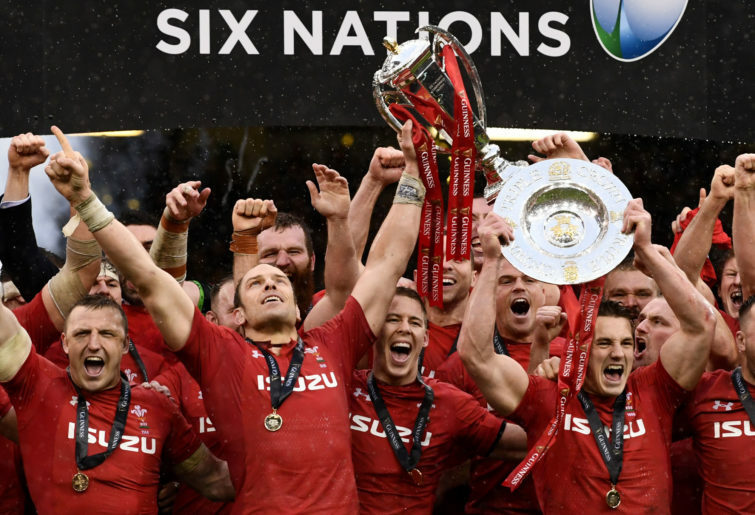 If the recent Six Nations tournament has proved anything, it has proved the enduring value of strong minds under pressure. Wales were 16-0 down at the half in Paris against France, but came back to win the second period 24-3. Facing a 10-3 deficit against favourites England in Cardiff, Wales grabbed the game by the scruff of the neck in the last half hour and won the critical phase of the match 18-3. Wales won not because they had a better talent level than England, but because they were mentally tougher at the key moments. Australian coach Michael Cheika now has some critical decisions to make in order to ingrain that toughness in his Wallaby charges in time for the World Cup. The Friday evening game between the Brumbies and Waratahs provided an excellent illustration of the issues he faces. 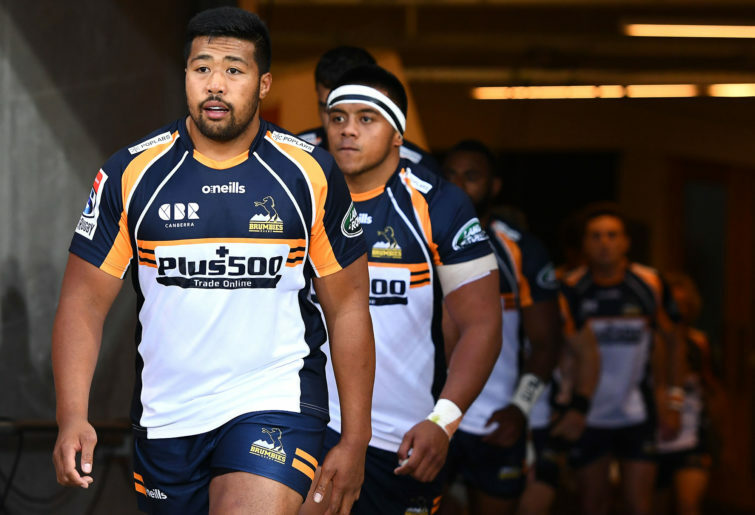 When they were first formed back in 1996, the Brumbies’ squad was made up largely of Waratah rejects or cast-offs, and they still tend to live in the shadow of their ‘big brother’ in terms of the available talent pool and financial resourcing. That has created a siege mentality in Canberra, a special desire to overturn the odds against their bitterest rivals. The Brumbies have won two Super Rugby titles to the Waratahs’ one. In more recent times, the Brumbies have won five and the Waratahs three of the last eight games between the two, by an average of 23 points to 20. By and large, the Brumbies have shown the mental fortitude to win the close ones. Arguably only five or six of the Brumbies who started the game on Friday evening would get into the Waratahs line-up by virtue of their talent alone, and key players like David Pocock, Allan Alaalatoa and Toni Pulu were missing through injury. They more than made up for it through their work-rate and determination to win the big moments in the game. Nowhere was this more true than in the back-row, where the unheralded Brumbies’ trio of Lachie McCaffrey, Rob Valetini and Tom Cusack overshadowed more illustrious counterparts. Michael Cheika may be expecting all of Michael Hooper, Jack Dempsey and Ned Hanigan to feature prominently in Japan, but on the day they were second best. The Waratahs’ version of LA’s showtime is wide-to-wide attacks based around the playmaking ability of Bernard Foley and Kurtley Beale. It was the Brumbies’ gritty defence of the width of the field which brought their back row into play. Out of a total of 26 wide attacks shifting the ball from midfield into the far 15-metre zones, the Tahs generated one try and four clean breaks while giving up seven turnovers. Those figures represent a win for the defence. In the first example, the initial cleanout by Adam Ashley-Cooper is banged off by Valetini, and Hooper and Hanigan are driven out of the play in the follow-up. 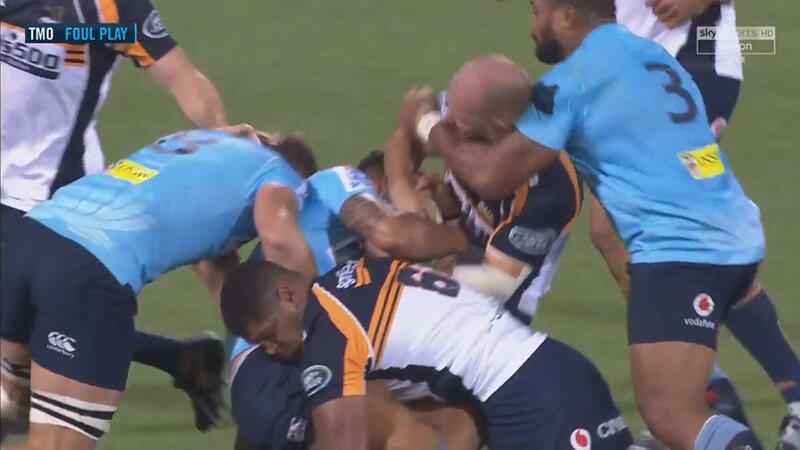 In the second instance, the Tahs create the break on the first phase from the scrum, but there are already three Brumbies (Henry Speight, Tom Banks and Cusack) in the picture before the first support player arrives. Scott Sio crushes Hanigan in the tackle, and Lachie McCaffrey is on hand to win the penalty on the ground. Although Hanigan manages to rumble forward ten metres in the choke tackle by McCaffrey, the metres gained are outweighed by the six-second delay after it collapses, with the Brumbies’ defence fully reset for the next phase. McCaffrey has the strength to handle Jed Holloway up top, allowing Sam Carter to sneak around the back and prevent the Tahs’ second-rower from getting to ground – turnover Brumbies. Lachie McCaffrey was originally perceived as one of those classic Waratah cast-offs, and little more than a journeyman when he opted to try his luck in the English Premiership back in 2014. His profile benefited greatly from a successful two-year stint at the Leicester Tigers, English rugby’s version of the Boston Celtics. McCaffrey sharpened his skill-set playing mostly at openside flanker, and he developed the strength of his mind in the Tigers’ notoriously unforgiving training sessions. It’s not just the quality of the initial decision to take the shortside, or the accuracy of the kick off the outside of McCaffrey’s right foot, or the speed and determination of the chase that is important here. Rugby is not just a test of skills, it’s a test of the capacity to handle pressure in the mind while staying within the laws of the game. How this sequence did not end with either a penalty or a penalty try to the Brumbies remains a complete mystery. When a group of Celtics supporters appeared in the aisles of the Boston Garden wearing white sheets before the first game of the 1984 series, Magic Johnson and the Lakers looked up into the auditorium and felt the true weight of history. These were the ghosts of NBA finals past, in which the Lakers had lost on all six previous occasions to their East Coast nemesis in the 1960s. The LA Lakers were one of the most skilful, star-studded teams in NBA history, but it was not until 1985 that they truly felt that they had conquered their psychological demons, and acquired the sheer mental toughness necessary to overcome the Boston Celtics. Wales have just completed a Grand Slam on the back of that same mental toughness, the ability to absorb pressure and emerge on the right side of it on the scoreboard. They probably did not play the best rugby in the tournament, but they were by a distance the best team in it. The Brumbies have made a living out of beating their more favoured neighbours from New South Wales, and it was no different on Friday evening. Lachie McCaffrey may not ever win as many Wallaby caps as Michael Hooper, Jack Dempsey or Ned Hanigan – he may not win any at all – but he is the litmus test by which all three must measure their efforts. As such, he is an invaluable asset to Australian rugby. Every pearl begins with a grain of grit, and every successful team begins with a fusion of strong minds. It is those minds and that grit Michael Cheika needs to discover before he begins polishing the Wallaby necklace later in the year.